These photographs first appeared April 4, 2000. Send your photographs for inclusion in this rotating gallery. West System's Annual Whaler Race! For 30 years, Meade Gougeon and Jim Watson (of Gougeon Brothers/West System) have been racing (mainly sailboats) against and with each other. Lately, this has evolved into "The Great Whaler Duke-Out", conducted each spring on the Saginaw River. The rules are simple: each boat must carry one passenger; the race begins with a running start at the Independence Bridge (where West System is located) and ends about three miles down river at the Hooters Restaurant in downtown; loser buys lunch. In this shot of the start, Meade (with brother Jan) has jumped out to a slight lead. 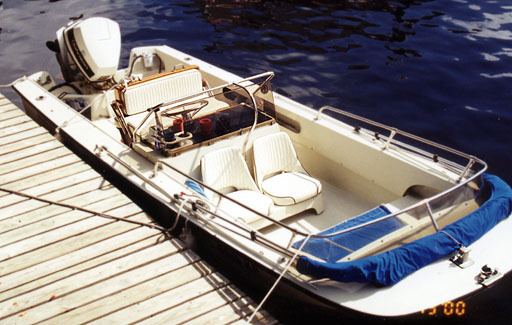 Meade's driving his '82 Whaler-13 with "brand-new" 20-HP Merc. Jim has "the lightest person I could find--Rita our 90 pound purchasing agent" aboard his '79 Whaler-13 with '79 Evinrude 25 Hp. In spite of plenty of prop-testing and tuning, and their aerodynamic leaning into the wind, Jim and Rita never caught up. Meade had lightened his boat to the minimum, removing all extra gear, and held the lead all the way to the restaurant, where Jim had to buy lunch. In the warmth of 1998's summer, this larger whale(r) rested in the secluded cove on the west shore of Porcupine Island, while migrating through Ontario's beautiful North Channel. Those are twin 150 HP Evinrudes on the transom. Don't try to find Porcupine Island on the chart--it's usually not named. It's the circular island just west of Croker, visible on Canadian Chart 2257 at 46° 05´ N, 082° 13.5´ W. The camaraderie between Whaler owners is such that Walt Steffens of Cincinatti loaned this beautiful boat to fellow Classic Whaler owner Don McIntrye for a week! Hey Don, look out for that big rock just to the right of the bow! This brand new 2000 Dauntless hull shows an bit of a resemblance to earlier Classic Whaler hulls. Maybe Whaler is leaning more in that direction? 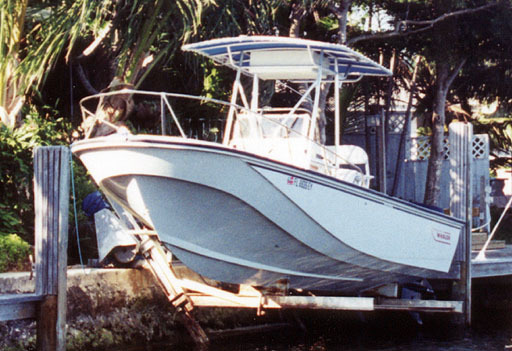 As roving cetologist Larry Goltz cruised the eastern Florida intracoastal this winter, he spotted this late 80's Outrage 22 with "Super Console." Its lift storage allows us this view of its classic hull form. The Tee-Top and helm seat were probably added more recently. 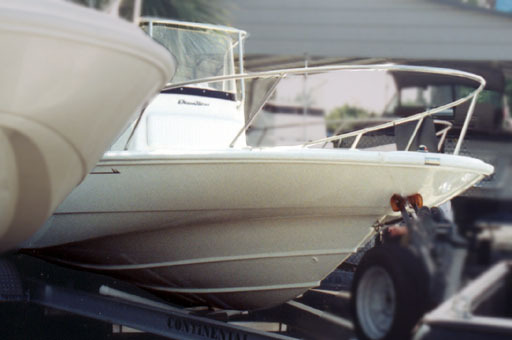 A pair of 130 Evinrudes are hidden on the transom. Larry snuck up on this whale(r) resting dockside, grabbing this close-up of the lateral/dorsal surfaces. This example is from the Newport genus c.1987 and shows the wide gunwales also found on the Striper. Of note is the reversable pilot seat, slightly evolved from its Montauk origins by the addition of a padded backrest. Beheath the seat a portion of the digestive track, a 28-gallon Tempo tank, is also visible. 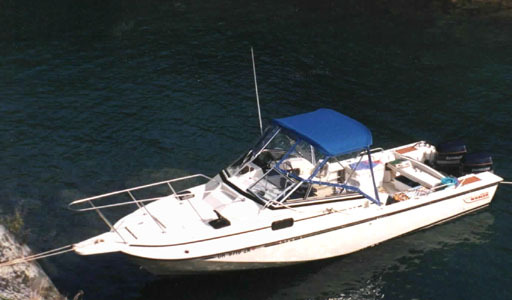 This frontal view shows the dual bucket seats of the Newport. This model evolved as a multi-purpose boat: fishing, skiing, and cruising-around. The canvas shown is not Mills. 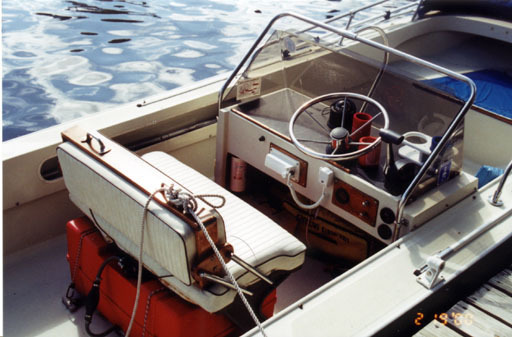 (You can tell by the plastic fittings on the frame and the location of folded storage; Mills products generally store inboard, not outboard of the cockpit). The Sampson post at the bow provides a hefty mooring point. Also note the still intact windshield/sprayshield formed into the bow railing. Send your photographs for inclusion in this rotating gallery.